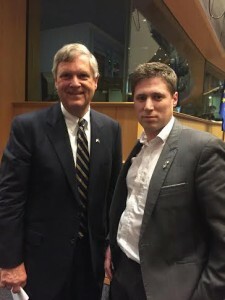 The Sinn Féin MEP for the Midlands Northwest, Matt Carthy, this week engaged in a dialogue with the US Secretary for Agriculture, Tom Vilsack, when he attended a meeting of the European Parliament’s Agriculture & Rural Development committee, of which Mr. Carthy is a member. Mr. Carthy questioned the American Minister on the prospects of increasing the level of Irish Beef permitted into the US market. He also asked Mr. Vilsack to outline US aspirations regarding the quota of American beef entering the EU market post TTIP (the EU-US ongoing trade deal negotiations). “Irish beef farmers will be very concerned to learn that Mr. Vilsack confirmed to me that the US administration wish to see a significant increase in American beef entering European markets as a result TTIP. Such an increase would undoubtedly displace Irish beef and put the livelihoods of thousands of Irish farmers in jeopardy. “This is one of the reasons why Sinn Féin have had a critical approach to the TTIP deal and why we have demanded that the Irish government should be protecting the interests of our farmers. Unfortunately the government haven’t taken our concerns, or those of the Irish farm organisations, seriously. If anything they have been the chief cheerleaders for a deal that could ruin the Irish beef industry. “For our part, I have been arguing that beef should be designated as a sensitive product and removed entirely from the TTIP negotiations. The Irish government should adopt a similar position. Anything else would be a betrayal of Irish farmers and the words of Tom Vilsack should leave nobody in any doubt about that”. “In January Minister Simon Coveney promoted the reopening of the US market to Irish as being worth ​€​100m per year. However, Irish Beef exports of just €194,000 were recorded in first half of this year since the previous ban was lifted. “This is due to the limitation of cuts that can enter the market, currently just high-value steak cuts, such as fillet, rib-eye and sirloin, which represent a small portion of the US import market. “The promised increase in trade will not take off until the current licence is widened to include mince, known in the trade as manufactured beef, which is driven by demand from the burger industry. I uregd Tom Vilsack to accommodate this licence widening recognising that Irish beef is produced to the best standards in the world. It is an issue I intend to continue to pursue in my role as member of the Agriculture and Rural development committee and the European Parliament’s delegation for relations with the United States.